I've been asked many times exactly what constitutes "a junior." Years ago (at least in the United States), a junior was an amateur under 18. 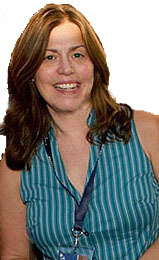 Things changed as the USTA began allowing those who turned professional to still play in national events. In addition to Melanie Oudin, there was another teen who kept them watching at the Open. Christina McHale, also 17, got her place in the women's singles draw after she captured Girls 18 Nationals. She won her first round over Polona Hercog and then came up against Maria Sharapova. Though it was Maria's match, the still amateur teen got to show the Arthur Ashe (and television) audience a glimpse into her future. Wildcard Gail Brodsky -- last year's Girls' 18 Nationals winner -- lost her first round to Anabel Medina Garrigues (20). Chase Buchanan, drew seventh-seeded Jo-Wilfried Tsonga for his first and final round in the main draw, but he had an incredible junior event. Ryan Harrison, another junior with professional status, and 2008 NCAA doubles winner Kaes Van't Hof (University of Southern California) seemed like a very odd pairing to me -- until I watched them play. They had the teamwork going through a first round upset over No. 6 Mariusz Fyrstenberg & Marcin Matkowski before a narrow loss to Carsten Ball & Chris Guccione that went the distance. As for other former college players, the best showing was for Travis Parrott. 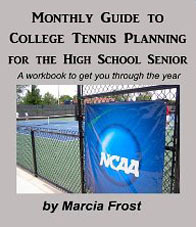 The former player from the University of Georgia (1999-2001) and the University of Portland (2002) was the U.S. Open Mixed Doubles winner. He shared the title with Carly Gullickson, a former top junior now on the pro tour (whose sister Chelsey is on the Bulldogs current roster). Though he didn't make it to the end, yet another Georgia player had the crowds on their feet watching his upsets. 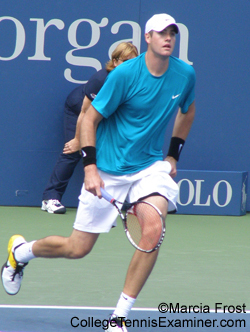 John Isner (pictured left) was actually the last American man standing at the 2009 U.S. Open. His trail of upsets included an incredible marathon match over friend and compatriot Andy Roddick, 7-6(3),6-3,3-6,5-7,7-6(5). John finally fell in the round of 16 to 10th-seeded Fernando Verdasco, in four sets. Jesse Witten, a graduate of the University of Kentucky, had a great tournament as he fought his way through the Qualifying, defeated No. 29 Igor Andreev in the first round of the main draw, took out Maximo Gonzalez in the second round and then forced fourth-seeded Novak Djokovic to four sets -- including two tiebreakers. Two-time NCAA singles champion Somdev Devvarman made his way through the Qualifying and won his first round over Frederico Gil before the former Virginia Cavalier lost in the second to No. 23 Philipp Kohlschreiber. The third former college player who had made it through the Qualifying was Michael Yani, who played for Duke. Michael had a tough main draw that started and ended with No. 22 Sam Querrey. In men's doubles, former NCAA champions (last year's winners) Bob & Mike Bryan fell in the semifinals. It was a tough 6-4,3-6,7-6 loss for the top-seeds to fourth-seeded Lukas Dlouhy & Leander Paes. 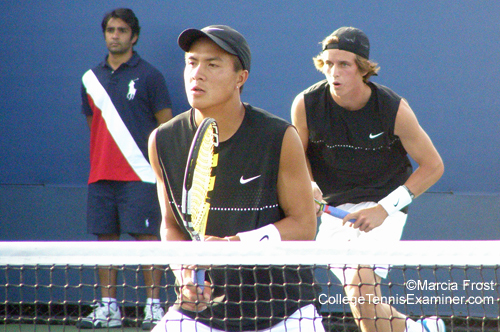 Daniel Nguyen & JT Sundling (above), the University of Southern California duo who came into the draw on a wildard after winning Kalamazoo, lost in three-sets to Maximo Gonzalez & Juan Monaco of Argentina. Robert Kendrick, who played for the University of Washington and Pepperdine, lost three close sets to Tommy Haas in the second round, the same round former Clemson Tiger Julie Coin ended her U.S. Open run in. The 2008 NCAA doubles champion from UCLA, Riza Zalameda, teamed with Ahsha Rolle for a near-upset of 10th-seeded Maria Kirilenko & Elena Vesnina before falling in three. Two former University of Florida players, Ryan Sweeting & Jesse Levine, came together for a straight set win over Johan Brunstrom & Jean-Julien Rojer. before bowing out of the doubles draw. And former Illini Rajeev Ram (who had lost is first round singles in four sets to Josselin Ouanna), got through one in doubles as he and Rik De Voest took out No. 14 Ashley Fisher & Jordan Kerr. NCAA singles champions Devin Britton and Mallory Burdette (above), both of whom have turned professional, had their day(s) on the Open court. For Devin, that day came on Arthur Ashe Stadium opposite a man named Roger Federer. It was a great effort out there by the former Ole Miss player. Past Duke star Mallory also came up against a stumbling block as Tathiana Garbin prevailed in her first singles match. The two then teamed together as the first reigning NCAA champions to play Mixed Doubles. It was a great match between two more NCAA champions -- Eric Butorac (Gustavus Adolphus) and Jill Craybas (Florida), with the later team winning 10-4 in a match-deciding tiebreaker.